Solanum tuberosum most commonly referred to as potatoes is a nice root vegetable to include when growing a vegetable garden. You can grow them very easily with little effort and I’m going to show you how. Seed potatoes that have already been sprouted. (Do this in late January if you’re live in a warm area or if you live in cooler area start in February). This must be done 6 weeks prior to when you want to start planting potatoes. The best time for growing great potatoes is anytime during March to April. You can even grow potatoes with little to no space. All you need is a big container and the good news about this is that you won’t have to worry about saving any soil space. Another option is growing potatoes in a barrel. These barrels can easily be found in any home and garden store. 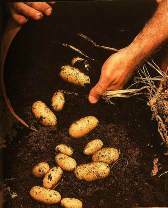 Potatoes can be grown in a very big pot that’s at least 12 inches deep and wide. A pot that is 18 inches can allow you to plant up to 3 tubers in it. To get the best crops, proper drainage is the key. That’s why it’s important to add a layer of stones into the bottom of the container or barrel. The next thing to do is to fill half of the container with multi-purpose compost. Place each tuber in the compost with its sprouts facing in an upward direction and cover with a few centimeters of compost. Water it regularly to keep the compost moist on a consistent basis. As soon as you see the first shoots, pile up the top with some more compost. This is referred to as an earthing up process. When you see the flowers start to open, that means the potatoes are ready for harvesting. This will usually occur around June or July. All you have to do is to tip the pot up and take out your potatoes like the illustration below. This is another easy way to grow potatoes. You just basically plant the potatoes in a big bag of compost. Place the bag up in a vertical direction and open it at one end. Place some seed potatoes with some force deep inside while making sure that there’s at least 4 inches of compost covering the tubers. If you notice any pushing to the surface during its growing process, add more compost. These are the full-sized potatoes that are cut into pieces, cured and planted. The individual pieces must be big enough to deliver nutrients to the new plant until it sprouts and can produce its own energy. It must contain at least 1 tiny round depression on the surface of the potato. On average a potato can produce 3 to 5 seed pieces. Take the cut pieces and cure them by drying them in a warm dry room for some days. This helps with the formation of callus that will prevent any rotting until the plants sprout. The sets are simply made up of very small potatoes that are planted whole and thereby prevent them from being susceptible to cut surfaces. The potatoes from the store don’t make good quality seed potatoes. They’re not usually assorted by variety and may have been sprayed with chemicals to force the sprouting process. It’s better to buy your seed stock through ordering from a mail-order professional or a local nursery. You can do this as soon as spring starts. When you do this not only you’ll be receiving the correct information on growing, you’ll also have a good set of varieties to choose from. Solanum tuberosum (potatoes) are extremely tasty vegetables and are very easy to grow. They are certainly one of my favorite vegetables as they can allow you to make lots and lots of meals with them. Solanum tuberosum are very popular in vegetable gardens and are definitely worth growing. For more info on how to grow potatoes along with some cool potato recipes you can check out potato recipes.com to get some excellent ideas for cooking and growing potatoes.